2. You want a calculator that “feels good”. Monroe’s exclusive IKT, Individual Keyswitch technology, gives it the lightest and fastest touch on the market. 3. 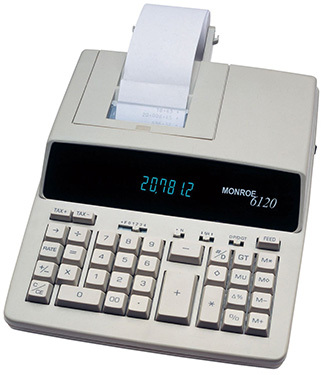 It should go without saying that you want a calculator with functionality designed just for you. Monroe has over 100 years of experience working with customers doing what you do. And, we’re the only company that designs calculator functions using that knowledge. 4. Stop switching back and forth between what your working on and programs like T Value to answer quick client questions. 5. Certainly you want a calculator with a name you can trust and a support staff armed with vast knowledge and eager to help. By the way, did you know we actually answer the phone?